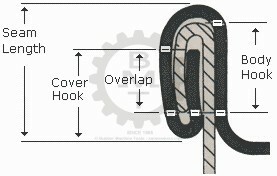 Can Seaming machines | Seam hook and Profile Measurement. Operating Limit : Equipment used under normal circumstances, combined with cans and ends (lids) manufactured to industry standards, should give seams with measurements within these limits. Measurements are for 3 piece standard sanitary cans, used as a reference for the canning industry. The Can and End (Lid) dimensions must be as per standards to achieve the correct final Seam profile. Seam Length greatly depends on the groove of the second operation roller and is directly proportional to the overlap, which should be approx. 60% (min.) of the total seam length. Double Seam tightness is ascertained by the wrinkle rating. more info 90 (0.075) min.